Rolf Roskam received the Diplom-Ingenieur (M. S. degree) in Electronic Engineering from Technical University Braunschweig in 1992. From 1992 to 1994 he has worked for company Siemens as consultant for PLC control and visualisation. After this industrial experience he was scientific engineer at University Hannover. In 1996 Roskam became head of the research department for metal forming machine tools. He received the Ph.D. degree in Mechanical Engineering in 1999. In 1998 he started his industrial career at company Bosch Rexroth as team manager for electronic development in the marine department. After two years he became head of this department. In 2003 Roskam received the call to become professor for Mechatronics from Ostfalia University of Applied Sciences. 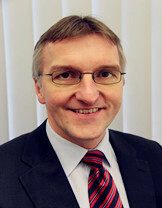 Since 2005 he is Head of the Mechatronics Institute at Ostfalia. He is responsible for international co-operation of the Mechanical Engineering Department especially for non-European countries and in 2007 he became Honorary Professor at Zhejiang University of Sciences and Technology. From 2008 to 2011 Roskam was Dean of the Faculty of Mechanical Engineering. He is working as independent expert for different research grants as well as accreditation institutes, has given international guest lectures and he has been chairman and committee member for several international conferences. His research was founded by industry and/or public in the area of electric and hydraulic drives and mechatronic and embedded systems.